Waste Not: Environmentally minded restaurants do their best to avoid wasteful items like styrofoam containers, water bottles, and plastic cutlery. The restaurant industry accounts for 10 percent of the U.S. economy. That means that tons of crumpled napkins, countless gallons of sanitizer-laced dishwater, and millions of those little squeezable ketchup packets result from our national obsession with eating out. Running a conventional foodservice outlet is hardly an environmentally benign pursuit. Restaurants--both casual and fine-dining--have a thirst for resources. Anyone who's ever worked in one, and especially anyone who's ever owned one, knows that for sure. There are tablecloths to wash, menus to print, ovens and burners to keep cranked up all day long, and walk-in coolers that your kitchen staff dart in and out of about a thousand times per shift. There are surfaces to sterilize, grease traps to unclog, and piles and piles of broken-down cardboard boxes to deal with. And that's not even counting the food. Staying on top of what seafood is overfished or sustainably caught from week to week is in itself a huge chore. But for the growing number of chefs out there who respect good food and want to continue to share it with other people, seeking out fresh, locally grown, organic food is worth the effort. It's also a draw for savvy customers, and it's more and more common for restaurants to proudly proclaim the pedigree of the meat and produce on their menus. There's more to being green than using organic products, though. Organic produce keeps pesticides and chemical runoff out of our water and soil, but it does not keep trash out of landfills and it does not conserve energy within the restaurant. Restaurants are one of the country's top consumers of energy. According to the National Restaurant Association, they account for 42 percent of all retail spending on fuels for heating. That's why some chefs and restaurateurs are pitching in to make dining out a greener experience. Erin Wheeler is a chef and one of the five co-owners of Sparks, a vegan restaurant that opened in Cotati in 2001 and later moved to Guerneville. Sparks' earth-friendly consciousness extends beyond the food on the plate to the plate itself and the napkin next to it. "We pretty much recycle everything that we use," Wheeler says. "Granted, we do have trash, but it's very minimal. Lots of the goods we use come in recyclable containers, because they are from sustainable, organic companies." One of Sparks' employees does all of the recycling, including the organic waste, which she composts for her garden. "All of our entrées come with a vegetable, usually broccoli or chard or kale. We all have dogs, and we take the stems of those and make doggie stew," says Wheeler. Instead of using paper napkins, Sparks has cloth hemp napkins, and its menus and promotional literature are printed on paper made from recycled U.S. paper money. "We use biodegradable to-go containers," says Wheeler. "We have cornstarch and wheat-starch spoons, forks, knives, and straws for to-go orders. We get our peanut butter and tahini in nine-pound buckets, and we sterilize [the buckets] and use them as part of our storage of food and whatnot. We try to reuse everything." That makes sense from a profit standpoint too, since the restaurant has already paid for the packaging of those items once. Reusing these instead of buying other food storage containers saves money. For catering--one of the most waste-intensive segments of the foodservice industry, since everything must be packaged and transported--Sparks avoids going through spools of plastic wrap by using Tupperware-type containers with tight-sealing lids. As for the food, "we definitely do on-site composting and recycling at caterings," Wheeler says. "We take responsibility of disposals for both and bring them back to the restaurant and incorporate that into our normal composting and recycling." Another not-so-obvious aspect of the foodservice industry--transportation--can also be approached with a sustainable mindset. All of Sparks' catering and deliveries are done with a vehicle that runs on biodiesel. Roxanne's, a fine-dining raw-foods restaurant in Larkspur, whose arrival over a year ago was much touted in glossy lifestyle magazines, built sustainability down to the smallest detail into its restaurant from the ground up. For instance, all of the wood used in the construction of the restaurant was recycled or certified sustainably harvested. The painted walls are free of chemical sealants or dyes; the counters are sunflowers pressed into composite board; the chair covers and banquettes are made from organic hemp chenille; and the curtains, tablecloths, and napkins are of unbleached organic cotton. To keep the loop as closed as possible, Roxanne's even has a photovoltaic solar plant installed on its roof. Chef Roxanne Klein and husband/co-owner have been criticized in some circles as idealistic dilettantes using the restaurant as an expensive hobby; the couple made millions in telecommunications, which they've used to finance the restaurant, and most restaurateurs, of course, don't have that kind of money to funnel into their business. Whatever the case may be, Roxanne's commitment to sustainability is very clear. Still, you don't have to break the bank to save the earth. Wheeler says that because Sparks was set up to produce as little waste as possible from the get-go, it's just an established part of operations. "It's very much built into our routine," she says. "That's how we started--wanting to be a sustainable business. It does take a little bit of time, but I think it also saves us time. Gathering all of the compost and recycling when leaving a catering site takes five more minutes than it does to just leave the trash there. But it's something we're committed to, and it's worth our time." Ultimately, it's not up to restaurants to make positive environmental choices--it's up to you. Every time you eat out, your dollars support the practices, good or harmful, that a restaurant follows. And while you may not always feel motivated to dine at establishments with reclaimed timber beams and biodegradable cutlery, there are still many ways to be a more conscious consumer. * Bring your own damn coffee cup to the coffee shop. Many places offer discounts for this, anyway. If nothing else, decline the very pointless extra cup some places use as a barrier for heat. * If you don't want something--butter for your bread, water glasses, cream for your coffee--request that it not be brought to the table. Often, it just gets tossed anyway, even if it wasn't used. * Find out where the restaurant's meat, produce, and bread comes from. Is it a local farmer or baker? If so, you are helping to cut down on transportation, supporting local economy, and probably getting fresher food. 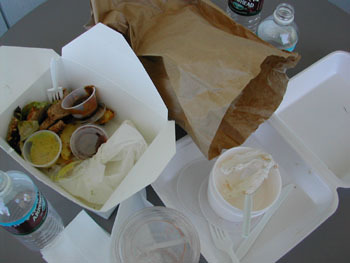 * If a takeout place you fancy uses styrofoam containers or just plain excessive packaging, ask them to change it. Better yet, tell them you'll bring your own container. (Be warned: You will get weird looks.) And decline plastic bags. * Drink draft beer. It takes energy to cart bottles to the recycling plant or landfill. Kegs use much less packaging, and draft beer is usually cheaper and better anyway. * With napkins, straws, and mustard and ketchup packets, only take what you assume you'll need. * Instead of taking out, dine in. You're already paying for the food, so why not get the dining experience--with real plates and food whose pedigree is known--to go along with it? Chefs Collaborative is a national network of more than 1,000 members of the food community who promote sustainable cuisine by supporting local, seasonal, and artisan cooking. Their focus is on sustainable food choices. Local members include Farmhouse Inn and Restaurant in Forestville and Roxanne's in Larkspur. www.chefscollaborative.org. Slow Food, the much-ballyhooed international organization, has a clear manifesto: to protect "the right to taste." In the North Bay alone there are five convivia, or chapters. www.slowfood.com. The nonprofit, San Diego-based Green Restaurant Association offers consulting, education, marketing, and community organizing to provide a convenient way for all segments of the restaurant industry to become more environmentally sustainable. To become a certified green restaurant, establishments commit to implementing a recycling program and completing four environmental steps per year of membership. www.dinegreen.com. From the July 17-23, 2003 issue of the North Bay Bohemian.